Right. Obviously, besides the single benefit stated above, there are also drawbacks with sending elephants into space. For starters, their somewhat larger mass means that you’re going to need a lot more thrust to get you up to escape velocity and out of the Earth’s gravitational pull. They’re also pretty big in terms of volume, meaning that you’re going to need to increase the size of your spaceship to house them. They eat more, they drink more, they poo more, but perhaps our major concern here should be that we’re clearly ignoring the most important factor to consider in this whole plan: they are elephants. Yes, elephants are ever so intelligent, but they are still elephants. We’ve all seen how clever and caring they can be on those nature documentaries, but elephants are let down by their inability to communicate in basic human language, let alone carrying out computer programming and complex scientific experimentation. 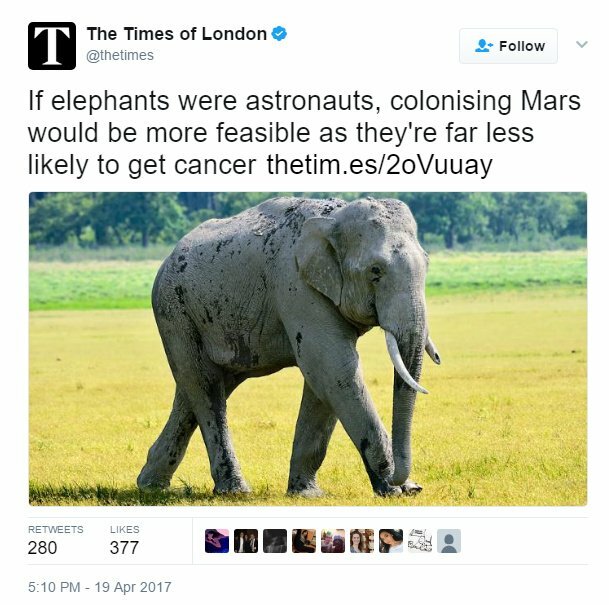 In fact, aside from their alleged cancer-resisting traits (and perhaps their reputation for having really good memories), there’s not an awful lot that supports this frankly very dodgy idea to send elephants to colonise Mars. And then, what if we were to actually follow through on this and colonise Mars with these pachyderms? It sets a worrying precedent for the future colonisation of other planets with somewhat implausible animals. So what next? Sending ornamental ducks to Jupiter? Hammerhead sharks to Saturn? An anteater to Venus? Presumably we’d have to send some ants as well for that last one. See how complicated it becomes? No, this is a silly idea and we should stop right now. The elephants won’t mind – they’re very thick-skinned – and it might just save us from the inevitable onset of any immature Richard Gere “gerbils in Uranus” jokes.